Can you believe that it’s the last Friday in July already? Where did the month go? Sit back and dig in to engage with some of the reading that I’ve done from the blogs of Ontario Edubloggers this week. A true scholar of education, Peter Skillen takes us through a quick review of educational theory and how it’s played out in Ontario. In particular, Hall-Dennis and the Common Sense Revolution. As Peter correctly notes, there’s so much in the Hall-Dennis report that could sustain a progressive, evolving curriculum. Of course, direction is dictated by the government of the time. It’s supposedly the will of the majority voting population. Much has been written about the current promise for changes in education, along with some of the things that have actually been implemented. I think that it’s important to realize that curriculum directs educators as to what needs to be covered and not necessarily what need not be covered. In this post, Peter introduces the notion of an “origin mindset” which should give all pause to think. There is great encouragement in the opening pages of every curriculum document. Have you read it lately? Jon Orr shares a post about a tool, and a product, that he’s used successfully in the classroom. He’s upfront that he’ll get a commission if you buy the product. What interests me in this post is how he builds on a sound pedagogy. I think back to my days of mathematics and it was anything but. I recall it as being me and the textbook doing problems. I always did well but we never worked in groups or had opportunities to show our thinking or our problem solving. Probably the closest was the traditional beginning of the class where selected students were to write their homework solutions on the chalkboard while the teacher circulated the room checking that everyone else had completed the overnight assignment. 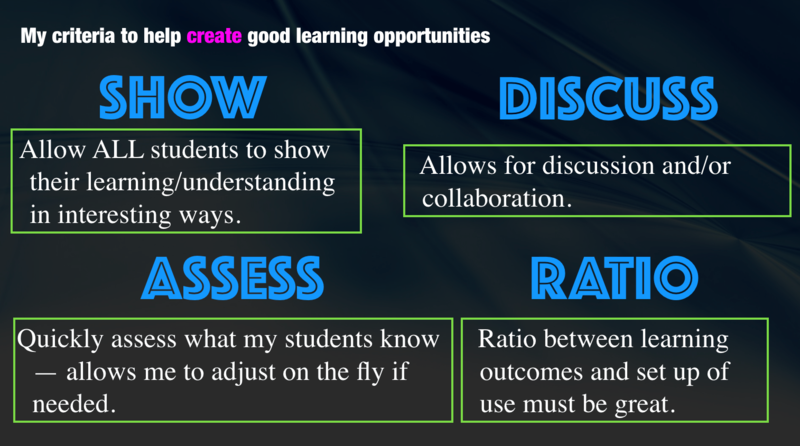 He includes an interesting graphic explaining his criteria for creating learning situations. If you created your own, would you align with his or do you have other ideas? I struggle with understanding his description of “Ratio”. I love the format of posts that come from The Beast blog. It starts usually with this long premise for the post and then the two ladies behind The Beast (Andrea and Kelly) have a back and forth sharing their thoughts about the premise. This was not a quick and easy read for me. It starts with the title and the premise is about summer learning, putting things off, and then a moment of reflection. It was the moment of reflection that really caught my attention. The Beast has featured 20 blog posts and a look back at what they were thinking at the time of writing. It’s probably a good activity and so I did that here. It was an interesting experience. I expected a brilliant deja vu experience. In some cases, it was. In other cases, I re-read a post and I have no idea what on earth I was thinking about at the time. I did jot myself a couple of notes as I was doing this and thinking about things. Is this the essence of blogging? Does it lead to regrets or to growth? If you know you’re going to evaluate yourself later, does that inhibit the desire to blog? 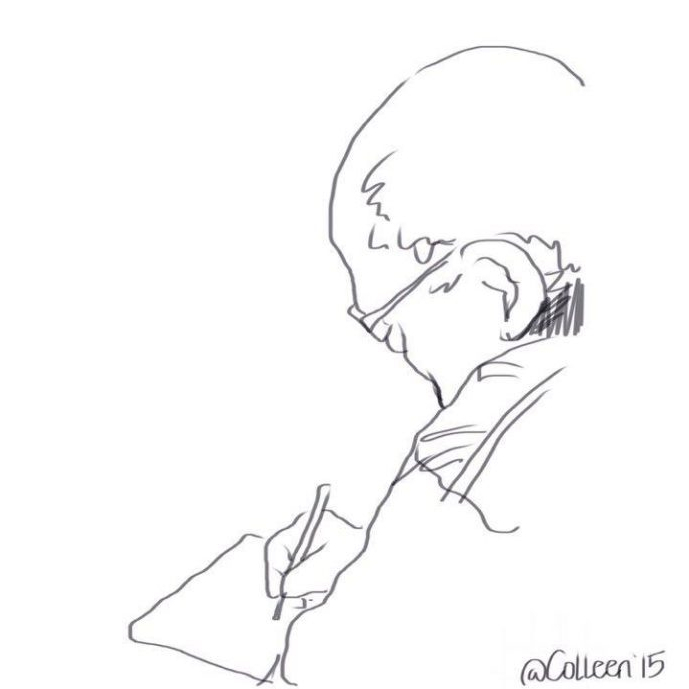 I know that I have forced myself to blog regularly just to document my thoughts at the time. The fact that I keep the posts around, I suppose, means that I stand by my words. I think that it’s also important to add “at the time”. If we truly believe that we’re growing and learning, then posts shouldn’t be construed as full stops but rather as stepping stones. Thank you ladies, you just made me think about my own philosophy of blogging. If you’re a user of Microsoft products, you need to make a point of attending a Partners in Learning event. If you’re a user of Google products, you need to make a point of attending a Google event. If you’re a user of Linux, I really don’t know what to suggest. Compile your own something? Larissa Aradj attended a Geo Teacher Institute at (I’m assuming) Mountain View and learned a great deal about geographic applications. This post is an accumulation of the tools that she learned about. Readers here know that I’m a sucker for mapping applications so I’m just pigging out on the resources that she shares. Many I did know about but there were some new ones – like Global Surface Water Explorer or Map of Life. I’m still hung up on the screen capture that she shares about 119 types of fish in Ontario. (Sorry, Larissa, I can’t bring myself to type fishes). For me, this is a fascinating collection and has quickly become an obsession. There are so many classroom applications that easily come to mind. Eva Thompson was a guest on the This Week in Ontario Edublogs show so we wanted to include a post from her. Previously, I had featured a post from her called The Interview as PD. This follows on it. You’d be lying, I’ll bet, if you read this and determined that the message Eva shares doesn’t apply to you. Haven’t we all been unsuccessful in a job interview at one point in time? If we really are learners, then hopefully we’ve learned from the experience and have become better as a result. I do wonder though, in applying for a position in your own school district, if the interview is entirely open and objective? Don’t we all carry our own reputation into the interview room with us? We talk about curating our own digital selves; we also be curating our own reputation at the same time. Eva seems to have developed and shared her own personal philosophy as a result. I think that’s a good thing. I’ve said more than once that superintendents, directors, and leaders within education should blog regularly. By this, I mean really a thoughtful sit down and sharing of feelings and thoughts post. Sure, you see the odd retweet from some but it’s often other’s original thoughts and often used to spread propaganda or some district initiative. It’s one of the reasons why Sue Dunlop is a regular on my reading list. She’s open and at times shares her vulnerabilities and what she’s doing about it. In this post, she talks about “flow” as defined by Mihaly Czikszentmihaly and nicely ties it into her thoughts about her own professional and personal life. This is an interesting read and Sue recommends that you spend 20 minutes with this TED talk. This post brought back memories of a graduate course I took once. The instructor had season tickets to the Spitfires and, when they played at home, our 7:00 class started at 6:30. Our instructor would book a guest speaker for the night, introduce the speaker to us, and then leave for the game. I would have loved to have read the evaluations at the end of the course. This was anything but in Diana Maliszewski’s Library AQ courses. Guest speakers can really enhance a course and bring in strong and differing viewpoints on topics. I think that’s important in the development of future teacher-librarians. That’s a powerful lineup. In true Diana style, there are pictures and a short summary of each of the topics addressed. As luck would have it, I had the opportunity to interview Melanie Mulcaster, one of the guest speakers in Diana’s class, this past Monday. If you missed it, enjoy. If you’d like to follow these bloggers on Twitter, here are links to their profile. If you’d like to “hear” most of this post, join Stephen Hurley and me on most Wednesday mornings at 9:15 on voicEd Radio and then repeated throughout the week. For the summer, we’ve invited a special guest host for each of the shows. Wow, Doug! Thank you for the flattering words. We sure are in interesting times — once again!